Product prices and availability are accurate as of 2019-04-12 08:52:33 EDT and are subject to change. Any price and availability information displayed on http://www.amazon.com/ at the time of purchase will apply to the purchase of this product. 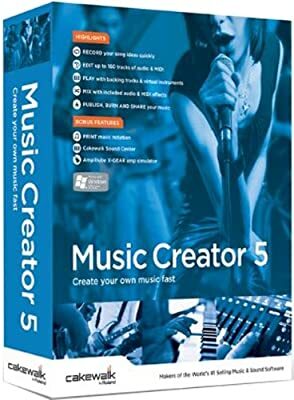 No matter what you want to record guitars, keyboards, vocals, CD samples, Or any other sound source Music Creator makes it easy to install and start recording. Music Creator comes with high-quality, cutting-edge instrument sounds that can be easily integrated in your projects. DropZone drag-n-drop sampler is perfect for creating remixes or for building the perfect hook for your song. It includes real instrument sounds, drums, vocals, REX-format loops, and more. Music Creator gives you powerful, easy-to-use editing tools and features a new console.. .. A new console mixer that allows you to mix your songs with the same feeling of using a hardware mixer. Add up to 24 effects per project and easily turn on/off the effects for quick A/B comparisons.